The Gulf of Mexico and Gulf Coast states have seen a plethora of thunderstorms since about mid-April. One of these episodes was a multi-day event that spanned April 16 – April 20. Multiple rounds of thunderstorms with very heavy rainfall (especially in and around Houston) and some significant severe weather (more hail and wind than tornadoes) traversed the region. The below animation shows these events and I included an example Mesoscale Precipitation Discussion (MPD) from WPC as a reference to the heavy rain. GOES-13 Infrared imagery with GOES-R Lightning Detection (Density) spanning five days (04/16-4/20). The Weather Prediction Center (WPC) Mesoscale Precipitation Discussion (MPD) for southeast Texas on 04/18/15. More recently, on the evening of 04/22/15, a couple strong supercell thunderstorms moved off the Texas coast near the Corpus Christi area and traversed the offshore waters passing relatively close to a couple oil platforms. 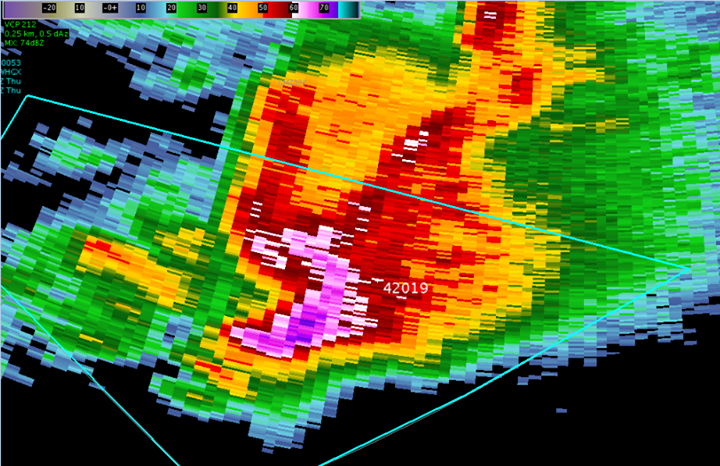 One of the more amazing attributes to the storms was the strong reflectivities of near 75 dbz! Although these were measured at high altitudes (based on the beam height), it’s interesting to note that large hail may have been occurring well offshore in the Tropical Analysis and Forecast Branch (TAFB) offshore zones. I have included a few animations showing the evolution of these supercells. Animation of the GOES-R Convective Initiation product with GLD-360 lightning strokes overlaid valid 4/22-4/23. National WSR-88D Mosaic base reflectivity with the Overshooting Top Magnitude (OTM) product overlaid highlighting the most intense updrafts associated with the supercells. The OTM product provides the difference between the overshoot and the surrounding cirrus clouds. National WSR-88D Mosaic base reflectivity overlaid with the GOES-R Lightning Detection (Density) product in 5-minute increments. Note the extreme amount of lightning occurring with the dominant supercells in the Gulf of Mexico. Here is a post from the National Weather Service Office in Houston-Galveston which nicely summarizes the threat posed to mariners from offshore supercells. All mariners out there…this is why you should ALWAYS heed a Special Marine Warning. Buoy 42019 measured a 76 kt / 87 mph wind gust at 729 PM associated with this Gulf of Mexico thunderstorm!